Quinnipiac’s Ike Azotam goes for a layup in Saturday’s game vs. Hartford. Quinnipiac’s Dave Johnson is fouled in Saturday’s game vs. Hartford. Quinnipiac’s Jamee Jackson boxes out in Saturday’s game vs. Hartford. Quinnipiac’s Zaid Hearst passes the ball in Saturday’s game vs. Hartford. 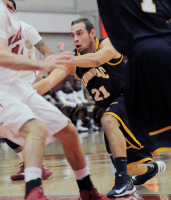 Quinnipiac’s Dave Johnson dribbles the ball in Saturday’s game vs. Hartford. Quinnipiac’s Evan Conti passes the ball in the lane in Saturday’s game vs. Hartford. Quinnipiac’s Ousmane Drame goes for a dunk in Saturday’s game vs. Hartford. Quinnipiac’s Justin Harris goes for a layup in Saturday’s game vs. Hartford. 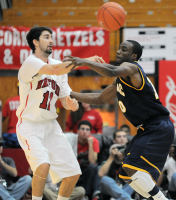 Quinnipiac’s Garvey Young guards a player in Saturday’s game vs. Hartford. Quinnipiac’s Garvey Young takes a shot in Saturday’s game vs. Hartford. Quinnipiac’s Dave Johnson shoots a free throw in Saturday’s game vs. Hartford. Quinnipiac’s Kendrick Ray shoots a 3-pointer in Saturday’s game vs. Hartford. Quinnipiac head coach Tom Moore talks to his players in Saturday’s game vs. Hartford. Quinnipiac’s Jamee Jackson celebrates after a 3-pointer in Saturday’s game vs. Hartford. Quinnipiac’s Ike Azotam drives to the hoop in Saturday’s game vs. Hartford.